We purchased this property in 2007 as it is one of the last pieces of beach front property available to own in the Mayan Riviera. Not only is it highly coveted real estate, but the construction is top quality. We wish we could spend more time there, but lucky for our guests, the condo is available for rent most of the year! A local cell phone is available for your use during your stay for a small fee. Wireless internet onsite. Excellent connection. Management has contacts with local catering companies, well as personal chefs who can come to the unit and cook meals with advance notice. There is an elevator from the ground floor that lets out directly in front of the condo front door. All doors inside the condo are 'extra wide' accommodating those with special needs/wheelchairs. Perfect for children and or adults looking for a getaway alone. The property has wheelchair access with an elevator, so any level of mobility can be accommodated. Cribs and baby bathtubs are available, as well as high chairs. Family friendly, lovely, spacious and clean. Private and perfect tucked between larger resorts. 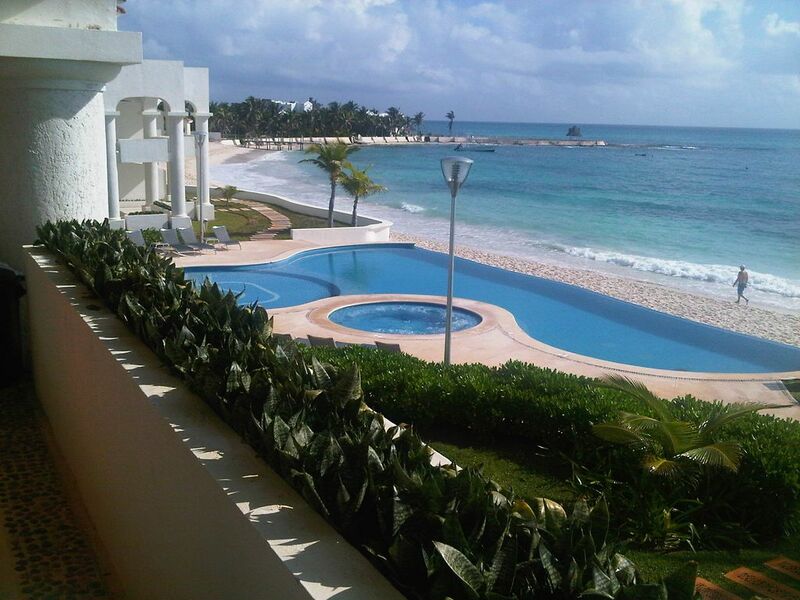 Nice beach and pool close to puerto Morelos. Beautiful!!! Thank you for your review. We are delighted you enjoyed yourselves and invite you back for another stay anytime! Thank you for being gracious guests. Stayed there with family for New Years Eve 2016. The place is very spacious, well maintained and has awesome views of the turquoise waters of the Caribbean from both the living room and the master bedroom. Especially enjoyed the large shaded terrace. Sarah was the most gracious and helpful host - providing lots of useful information prior to our arrival and letting us stay a little later on check-out day to accommodate our late flight. We had a great time overall and would love to go back. Large ameneties, little dollars, hugely satisfied! Iris, Manager, was great to deal with...both via email and in person. Facility was all you could ask: modern, clean, spacious, private, good showers/sinks/kitchen/beds. Inifiity pool, patio, and grounds were perfect; steps to the ocean. Was here for "guys weekend" and it was perfect. Would recommend in a heartbeat. A Perfect 10 ... We will go back! This property exceeds expectations, and is a must-visit for us in the future. In fact, I am somewhat hesitant to write a review... hoping to keep this a well-kept secret! I travelled with three children, ages 10, 9 and 6. The condominium is spotless and full of all the amenities a family needs for a week on the beach. Three large bedrooms, a fully-furnished kitchen, three bathrooms, a washer and dryer in the unit, and a beautiful balcony that overlooks the ocean. While many properties may boast "ocean-view," you can't get closer to the ocean than this. The beach and the pool are steps away. The owners provide a local property-manager who is available at all times to answer questions about the property, or simply recommend a quaint restaurant for dinner in nearby towns. I will, and have, recommended this destination to friends and family. Whether you are looking for a family vacation or a quiet week on the beach, you will not be disappointed with this property. It's location is peaceful and quiet. I couldn't have asked for anything more. My thanks to the owners for a Perfect 10 vacation. Payment can be made through Paypal via credit card or money orders/ cashiers checks also accepted. A 50% deposit is required on all stays at the time of booking. If booking is made within 30 days of stay, the full amount is expected at the time of booking.